While not a flagship killer by vocation ZTE’s Blade S6 has a lot of potential for its $250 price tag. It’s built around Qualcomm’s upper-midrange Snapdragon 615 chip that boasts a 64-bit architecture and octa-core prowess for on-demand power and battery preservation, 2GB of RAM, two nano-SIM card slots, a 13MP camera on the back and 5MP on the front along with a 5″ IPS display of 720p resolution. With this type of hardware rig a high price tag might seem unavoidable but ZTE manages to keep it in check and as a result bring in a lot of attention toward the Blade S6, which coincidentally premieres on the market today and is selling like hot cakes. At the moment of writing it has hit some 4.5 thousand units sold on AliExpress where it’s being exclusively sold right now. The ZTE Blade S6 has an interesting mix of ZTE’s own style and Google’s way of operating Android. Built around a stock copy of Lollipop ZTE’s software, called MiFavor UI v3.0, has its custom theme that allows for deep customization of wallpapers and even homescreen transition animations. For that and more here’s our video on the ZTE Blade S6. In order to secure the lower price tag ZTE has had to cut some corners with the Blade S6 but has done so in elegant fashion. The outer shell of the ZTE Blade S6 is made out of plastic but the phone looks as though engulfed in an aluminum shell. The corners are rounded and edges polished with nothing sharp or chamfered to disrupt the smooth design. The front reminds us a little of Motorola’s Moto X (2014) with a curved glass that allows the finger to effortlessly slide until it falls off the edge. The 5″ display is of IPS credentials and a good 1280 x 720px resolution. It’s not quite in Retina territory at 294 ppi but we have to say we can’t see pixels. The panel is very bright with good, punchy colors. In true IPS fashion the viewing angles are also top notch. Below the display sit three capacitive buttons for home, back and menu but only the middle one is visible. ZTE has gone with a circular shape and all three buttons glow in blue. 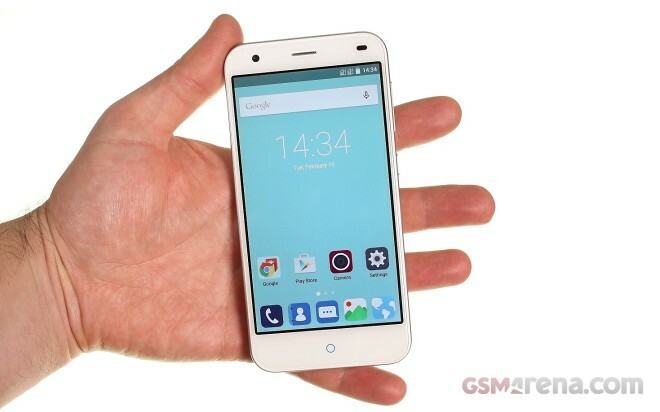 ZTE has managed to keep the Blade S6 very compact and also keep the weight down. When you first handle the Blade S6 you immediately expect it to weight more, perhaps because of its metal appearance. This is definitely one of the lightest 5-inchers we’ve handled at HQ. So the ZTE Blade S6 gives out a rather great first impression. It’s hardware is comfortable to hold and use and the display has great angles, colors and sharpness. On the software side we appreciate ZTE going for stock Android and having the latest one is great too, enrolling the Blade S6 in rather exclusive company. It could, potentially, ensure faster future updates as well. Now that we’ve brought you the hands-on it’s time to get back to the lab and start work on the full-fledged review. Stay tuned.